Check out Hey Harriet for more shadows. Wonderful shot. I think every home should have guard pequins. What a handsome door guard! I like his splendid neck tie! How cute...I love his puffed out chest!! Wonderful SS!! This is penguin season for sure, especially since the ice is coming down now...brrrr...sure we'd love to see ya stop at Sisters', you would not regret it, it's awesome! I love that you have penguins welcoming guests into your home! Wherever did you find them??? So sweet! I'm sure that cute penguin waddled over to the sun without any assistance from you ;) Such a fun shadow shot! 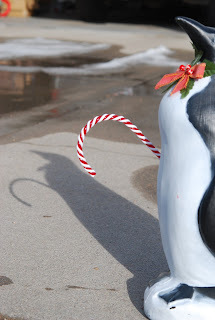 Hope the penguin is holding on tight to his candy cane. I have a craving for a candy cane right now! how very cute, worth moving to catch the shadow :0)Love your ss from last week too, just had a peak, and all handmade - awesome!! Your penguin is a cutie. He certainly beats having a flamingo! Is there a story behind the penguin? I mean, why does he have a candy-cane? I'm just ... not aware of Christmas stories with penguins in them! What a festive shot! I have a friend who loves penguins...I should send her your link.